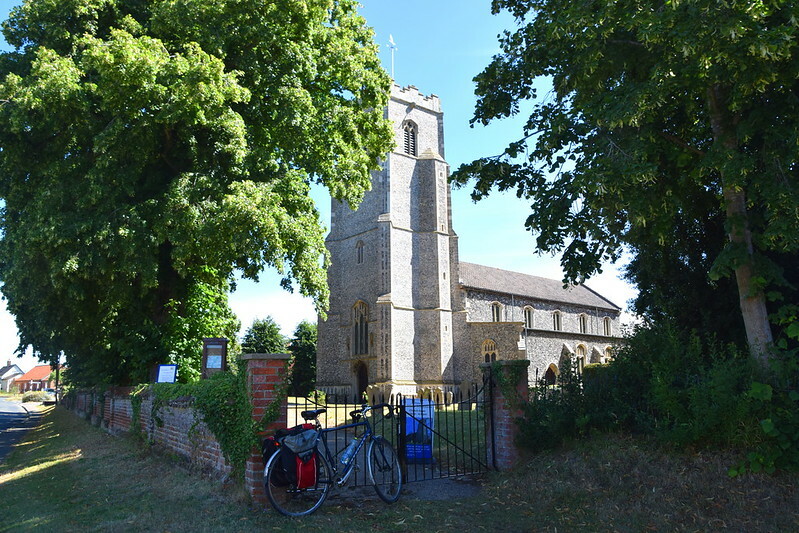 The two large villages known as the Pulhams sit to the east of the main road between Ipswich and Norwich, and Pulham Market's name tells us that the citizens of the earlier of the two, Pulham St Mary, established a trading centre a mile or so distant on the road which grew into a second village. The centre of Pulham Market is a satisfying piece. The village green is wide without sprawling, and two old inns face each other across it. Behind one is the church, with its powerful 15th century tower. The inns, and many of the other houses, date from the 18th and even 17th centuries. Chocolate box scenes like this are rarer in East Anglia than you might think, and no one would seriously think of Pulham Market as a town today. But the green was the former market place, and as the name suggests this was a market town from the 12th century until well into the 17th century. There was a railway station, but the line has now gone, and the main Ipswich to Norwich road now bypasses the village. For most people, their abiding image of the Pulhams will be the old workhouse, now converted into flats with a garden centre surreally in front of it, on the A140 to the west of here. 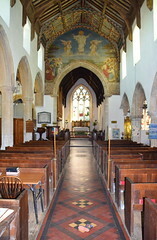 St Mary Magdalene is a big church, a town church. Externally, it is hard to see anything that is not late-medieval, and this building would look quite at home in the centre of Norwich, perhaps somewhere along St Benedict's Street. Entering into the spirit of the the thing, the Victorians treated St Mary Magdalene to an overwhelming restoration in the 1870s. 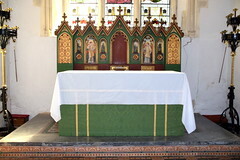 They don't seem to have touched the structure much, and just about all the money, £1,800, went on internal furnishings. Pevsner quotes this amount from Kelly's Directory with one eyebrow raised, because it is about £350,000 in today's money, which is not much to pay for rebuilding an aisle or a tower, but buys an awful lot of Minton tiles and pitchpine benches at a time when, it is worth recalling, labour was very cheap. The niches that flank the west window and door of the tower appear to have their original statues in, albeit too worn away to be certain. It appears to be an Annunciation scene. As at Pulham St Mary, there is a grand early 16th century porch - not as ornate as the one in the sister village, and on the north side this time. 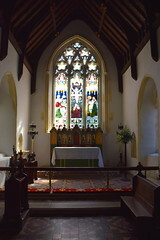 A curiosity is that the large east window of the porch lights directly into the west end of the north aisle. This would seem to suggest that the porch predates the aisle, but it is so late that it is hard to think that there would have been time to build it before the Reformation set in. As we will see inside, the arcades have little to offer on the subject. 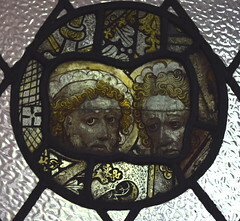 Perhaps the window was an attempt to lighten what is a fairly dark interior. Today, some panels of medieval glass have been reset among frosted quarries, better than it sounds but difficult to photograph without through light. You step into a large, slightly anonymous interior, a town church. And then, the surprise of those arcades. The most western bay of the south side is rounded, and then it leaps away eastwards with pointed arch. The north arcade columns are fuller, with four shafts each, and may postdate the porch, or may not. A pleasing mixture, which lightens the sense of an off-the-shelf design. 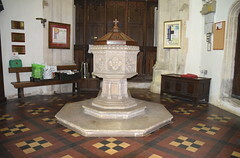 The font, at the west end, may help explain some of the cost, as it is a fabulously ornate Victorian piece, somewhat in the style of that at Norwich St Lawrence, with a castellated rim. As well as the big 1870s restoration, throughout the 19th century, and well into the 20th, fabulous money was being spent here on glass of the highest quality. 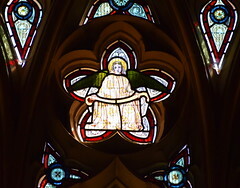 The very earliest is in the east window, and yet this is still as late as 1873. 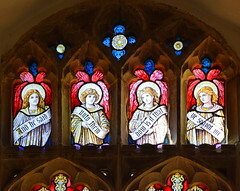 The work of Henry Holiday for Heaton, Butler & Bayne, it depicts three scenes in the life of St Mary Magdalene. In the centre, she sobs at the foot of the cross. On the north side she washes the feet of Christ, and on the right she returns to the upper room to tell the disciples that the tomb is empty. 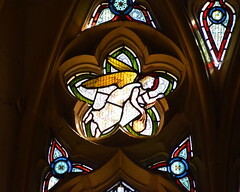 The best of the rest of the glass is in the south aisle. 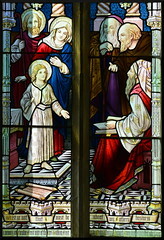 An oddity is the east window here, an Adoration of the Magi scene which appears to be the work of Henry Holiday for Powell & Sons, but instead of the pre-Raphaelite colouring you might expect it has been rendered in sombre browns. Birkin Haward thought it was 'dreary', and it isn't helped by the nature of the stone guard on the outside. 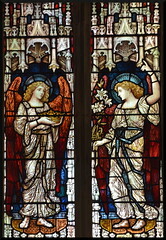 The lovely Annunciation scene to the south of it is a later work of the same workshop, while the angels at the west end appear to be another Henry Holiday design, probably for Powell & Sons. 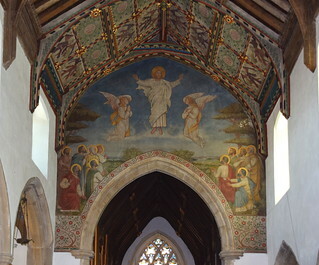 The most striking feature of the Victorian restoration is the vast mural above the chancel arch, depicting the Ascension, an awkward subject. In medieval times, it was conventional to portray it as the gathering together of the Apostles, who pray and look upwards, prefiguring Pentecost. Christ's feet in the clouds above would remain to remind us of the incarnational nature of the story. 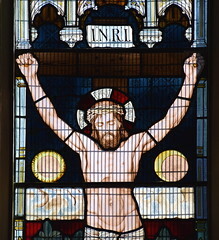 The Victorians preferred to show the whole body of Christ, with the Disciples marginalised. Perhaps they were uneasy with the Catholic feel of the traditional iconography. Whatever, it is hard to show a man ascending with dignity, even the Son of Man, or especially so. Should he flap his arms? Should he look downwards at his followers, or upwards at his destination? As so often, Pulham's Ascension looks like nothing so much as a robed figure trampolining. Thankfully the restored canopy of honour in the roof to the west of it, shows the Victorians doing a much better job of seeming convincingly medieval.